According to the annual reports published by the Northern Ireland Statistics and Research Agency, Jack and Katie were the most popular babies' names registered in 2009. There were 25,487 births registered: 13,090 boys and 12,397 girls. Jack has been the most popular boys name for the last seven years. Matthew and Daniel has also kept their rank, while James has climbed from the 5th most popular name in 2008 to the 4th place. Adam has increased in popularity and returned in the top 10 at rank 6. The highest climbing boy's names were Aodhan (up 49 places), Charles (up 46 places), Lucas (+31) and Oscar (+27). 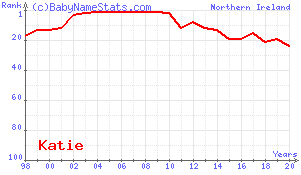 For girls, Katie entered the top 10 in 2002, becoming the most popular name in 2004, where it has remained since then. Sophie and Grace remain the 2nd and 3rd most popular names in 2009. Erin has increased in popularity and entered the top 10 at rank 5. The highest climbing girl's names were Miley (up 271 places), Faye (up 115 places) and Lexi (up 99 places). Over the last decade, parents in Northern Ireland have become more diverse in the first names they have given to their babies. In 2009, there were 2,052 girls' and 1,473 boys' names used, compared with only 1,597 girls' and 977 boys' names in 2001. These figures also show that girls are given a wider variety of names in Northern Ireland than boys are. Notes: Only the first names recorded on birth registrations were used for this analysis. Different spellings of a name have been treated as separate names. Names containing accents have been recorded without those accents, e.g. Séan was recorded as Sean. Names of equal rank have been placed in alphabetical order.